Students have the best chance of succeeding when their schools have the resources to educate them effectively. As Massachusetts lawmakers gear up for the Fiscal Year 2020 budget debate, many are working to overhaul the state's school funding formula - known as Chapter 70 - which determines how much state funding our schools receive to support necessities like teachers, materials, and facilities. When the formula falls short, communities with fewer resources are unable to make up the difference and their students' education suffers. 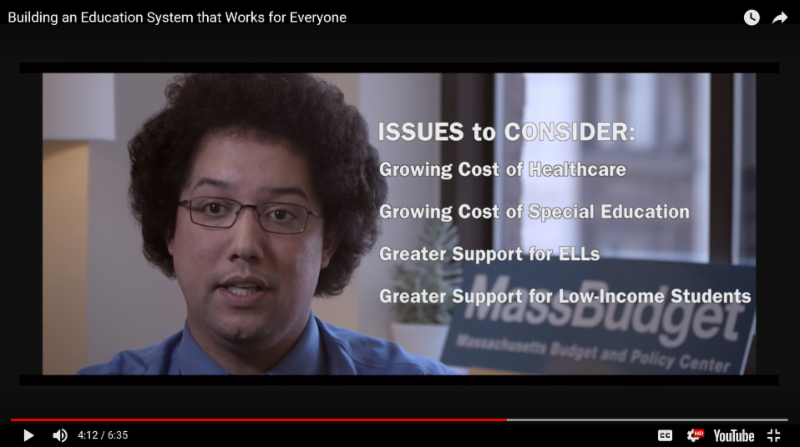 A comprehensive update of the school funding formula, after five years, could mean as much as $1.1 billion in additional aid per year for Massachusetts schools, according to a new video from the Massachusetts Budget and Policy Center (MassBudget). We further explore these ideas in an op-ed in Commonwealth Magazine. "The outdated formula does not reflect what it currently costs to provide a high-quality education. This has left many lower-wealth school districts with chronic understaffing, a return of class sizes of over 30 students, and fewer opportunities for our students to learn," said Colin Jones, Senior Policy Analyst and author of the report on which the video is based. In the video, Jones summarizes the findings of his report, Building an Education System that Works for Everyone, which explores some ways lawmakers could update the formula. "Even though Massachusetts has the most educated workforce in the nation, these opportunities are not reaching all our children. If we want to continue leading the country, we need to help close these opportunity gaps so all children can reach their full potential," said Marie-Frances Rivera, Interim President of MassBudget.